Learn more about Ankle Arthritis! Pain is the most common symptom of ankle arthritis, although there are many things that can cause ankle pain aside from arthritis. Arthritic ankles often swell in proportion to the degree of inflammation and use. The motion becomes limited. If the joint is forced into the extreme limits of its motion, it will be more painful. Occasionally, the alignment of the joint will change because of wear of the bone on one side of the joint or because the ligaments on one side of the joint stretch. By far the most common cause of ankle arthritis is injury. In contrast to the knee, which develops arthritis usually for genetic reasons, the ankle rarely becomes arthritic unless something happens to make it abnormal. Unfortunately, when it becomes abnormal, arthritis can develop rapidly. Common injuries that lead to arthritis are fractures, tendon deterioration such as when the arch falls, and severe sprains that result in ligament damage and stretching. Occasionally, diseases such as rheumatoid arthritis can lead to arthritis. Genetic causes or simple wear and tear are rare causes of ankle arthritis. What do I do about Ankle Arthritis? Initial treatment is always non operative. Treatment of ankle arthritis is initially done without surgery. Anti-inflammatory medication such as Aleve, Motrin, Celebrex and other medications such as Tylenol can effectively decrease the pain while they are being taken, but do not cure the arthritis. Steroid injections can occasionally be done and can eliminate episodes of intense pain, but do not cure the arthritis. Injections and oral medications of natural joint components such as glucosamine and chondroitan sulfate are shown to give temporary relief and have few side effects. Tablets with these medicines can be obtained at the drug store without prescription. Use of these medications should be discontinued unless considerable pain improvement is experienced. Arch supports and other braces can also decrease motion around arthritic joints and help to relieve pain. Finally, certain exercises and stretches loosen the joints and prevent overuse of arthritic areas. Braces are commonly used to control the motion of an arthritic ankle. 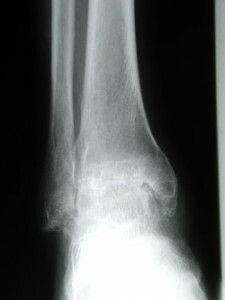 The worn portions of the joint commonly abut one another is the foot is dorsiflexed too far. For this reason, a heel lift may prevent this an may give you comfort. Inexpensive adhesive heel lifts can be placed in a shoe to help. Simple braces such as the a lace-up, athletic brace can also help. More sophisticated, custom, but also more expensive braces, such as the Arizona brace or short articulated ankle-foot-orthosis (AFO) are most effective. They will help an arthritic ankle feel better, but will not cause it to heel. The effect on progression of ankle arthritis is unknown, but I suspect it has little effect on this. Surgical treatment of ankle arthritis can be considered when non-operative treatments fail. Occasionally, removal of spurs or loose bone fragments can give relief, but are usually suggested only when arthritis is mild. It is difficult with current techniques to directly repair the cartilage damage in advanced ankle arthritis. Further surgical treatment of ankle arthritis involves a more substantial intervention and recovery. The choices are ankle fusion or ankle replacement. 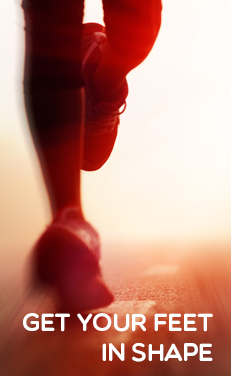 Ankle Fusion involves removing the joint cartilage and tough bone beneath it, called the subchondral bone. The raw bone surfaces are then pushed together to allow them to heal with bone crossing the joint. Screws and other devices are often used to hold the bones still, helping the new healing bone to cross the joint. The ankle can no longer move after this, but the other joints in the foot can often move allowing a near normal gait. This can be done through an open incision or by using smaller incision and a fiber optic camera called an arthroscope. An arthroscope is an instrument about the caliber of a pencil that is placed into the joint through one-half inch incisions to clearly visualize the joint. These procedures generally require an over-night stay in the hospital and the ankle is immobilized in a non-weight-bearing cast for six to ten weeks. 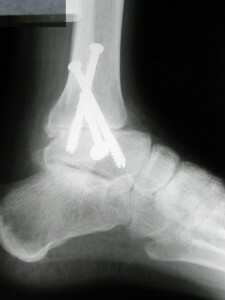 Ankle Replacement is the substitution of a plastic and metal device after removing the joint. Most people are familiar with a similar procedure done on the knee and hip. However, the technique of ankle replacement did not enjoy the initial success of hip and knee replacement. In fact, for many years, it was not done in the United States because of poor results and complications. With further research and improvements in design, the current ankle replacements seem promising. Many designs are currently in use in the United States, the Wright In-Bone and Prophecy, the Agility by DePuy, the SBI STAR, and the Salto by Tornier. Zimmer has also recently brought an unusual one out that is inserted from the outside of the ankle. Most have been in use for ten to fifteen years outside of the United States, although their use in the US has been more limited. When choosing between these techniques, a frank consideration of the risks and benefits of each should be carefully assessed. Ankle fusion has the disadvantage of permanently eliminating ankle motion. When ankle motion is eliminated, many physicians believe that the stress on the surrounding joints in the middle of the foot is increased, potentially leading to further deterioration of these joints. However, once the ankle is fused, it will remain fused and should not require reoperation at this joint. Ankle replacement retains ankle motion and, therefore, gait is more normal and stress to other joints is decreased. However, infection and wound breakdown after ankle replacement are sometimes disastrous complications. 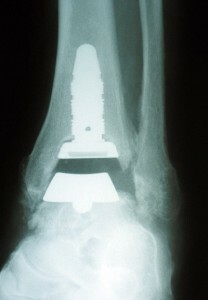 The technique for implanting the ankle replacement is more demanding and intraoperative complications are more frequent. These complications may require further medical care including surgery to treat. Severe malalignment or ligament insufficiency. Extensive scaring, rashes, or eczema around the front of the ankle. Young, highly active, or athletic people. People with severe nerve damage from diabetes or other causes. ASK A QUESTION/SIGN UP FOR OUR NEWSLETTER!